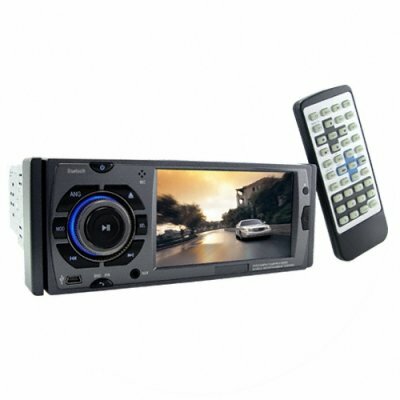 Successfully Added All In One Car DVD Player - Car Entertainment System to your Shopping Cart. All in one Car DVD player with massive amounts of in car entertainment features. If you are looking for a great music and movie experience, this 1 din car DVD comes with a large 4.3 inch touchscreen and the ability to play multiple disc formats as well as digital media codecs via iPod, SD cards or USB drives. If you are looking for safety, a built in Bluetooth for handsfree calling, video in for rearview cameras, and even a detachable face plate with a carry case has you covered. Using the various RCA connections, you can even make this the center of your cars entertainment by connecting it with other LCD screens and speakers so the whole family can join in the front seat fun. All this and more is available at Chinavasion's super low wholesale price that only gets better when you order in bulk..
Front Mount AV and Audio for Simple Connection of MP3, MP4, Game Consoles etc.